For many years scientists, pathologists, urologists, and oncologists have been trying to understand what causes prostate cancer. And of course we still don’t know. What we do know is that before there is a prostate cancer cell in your prostate there must be something else. In other words, prostate cancer cells do not suddenly spring into existence fully formed and without any sort of explanation. In other words, before patients get prostate cancer, many of them may get either a condition called prostatic intraepithelial neoplasia, commonly abbreviated to PIN or a condition known as atypical small acinar proliferation (ASAP). 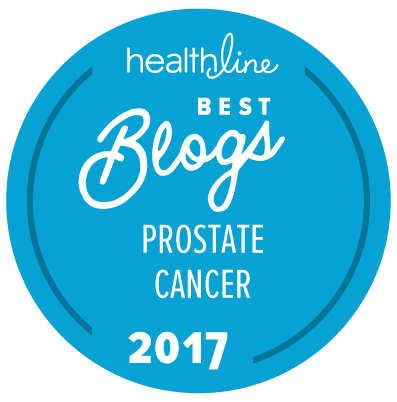 In this section of The “New” Prostate Cancer InfoLink, we will try to explain what PIN is, and perhaps more importantly what you and your doctor should consider doing about it. ASAP is dealt with on another page. For a detailed discussion of PIN, with many images and references, we recommend that interested readers refer to the article by Dr. Bostwick that appears on the Bostwick Laboratories web site. If you imagine that there is a continuous range of identifiable situations related to prostate cancer — from the very first biochemical event or mutation that leads to the development of the very first malignant prostate cancer cell right through to the extensive growth of bone metastases, then at least some type or types of PIN may well be the first of these situations that a pathologist can actually see under the microscope. Many years ago, Dr David Bostwick suggested that there is a close relationship between the age-related prevalence of PIN and the age-related prevalence of prostate cancer. Figure 1, which has been adapted from material published by Dr Bostwick, clearly indicates that the occurrence of PIN seems to parallel the occurrence of prostate cancer, with prostate cancer lagging about 20 to 30 years behind the appearance of PIN. This suggests that if one carried out prostate cancer screening in younger and younger men, we might find lots of cases of PIN. Then we’d have to decide what to do with them! and prevalence of prostate cancer. In Issues in the Diagnosis and Prognosis of Prostate Cancer: A Slide/Lecture Series. PIN can be discovered in exactly the same way as prostate cancer. A man comes in for a check up. He has a DRE and a PSA test. The PSA test comes back positive even though the DRE was negative. The doctor does a biopsy. When the pathologist looks at the biopsy specimen, he or she can find no sign of cancer, but there is a clear occurrence of PIN. For the physician and the patient, there is only one important question. Now what do I do? Figure 2. 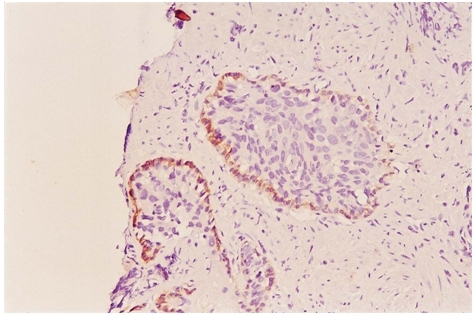 Two ducts with high grade prostatic intraepithelial neoplasia (PIN). It is worth pointing out that at the moment there is no clear relationship between PSA levels and the occurrence of PIN. Nor are there any indisputable data indicating a clear relationship between the occurrence of PIN and the presence of prostate cancer. However, if the physician is told by the pathologist that there is high grade PIN in the prostate, it is generally agreed that the patient is at significant future risk for prostate cancer. First, it should be made very clear that a diagnosis of low grade PIN is not considered to be significant. In other words, if your doctor finds only low grade PIN in the biopsy specimen it is recommended that he just send you home while telling you to come for your next check up a year later. First, the pathologist should re-examine all of the original biopsy tissue with the greatest care for any traces of prostate cancer tissue. Second, assuming that there is still no trace of prostate cancer, the urologist should give you another PSA test and carry out a second biopsy. If cancer is found on the second biopsy, then the patient should be treated accordingly. If there is still no cancer after the second biopsy, your doctor should ask you to come back every 6 months (or four times in the next 2 years) for a repeat biopsy and PSA test. If there is still no sign of cancer after 2 years, then your doctor is advised to ask you to return once a year for the next two years for biopsy and a PSA test. The general expectation which is being followed here is that high grade PIN found as a consequence of an elevated PSA is a very close predictor for small foci of localized prostate cancer. Thus, multiple biopsies should be carried out over time to ensure the identification of the cancer and appropriate treatment. At the moment, there is no evidence that PIN can be successfully treated. Specialists currently recommend that identification of high grade PIN should not in any way affect the treatment of a patient, except that that patient should be regularly rechecked for signs of prostate cancer as discussed above. Having said that, there are several ongoing trials that are seeking ways to prevent PIN from transforming into prostate cancer (see ClinicalTrials.gov for the latest information). Content on this page last reviewed and updated January 28, 2009.